A former manager with the Northwest Territories government says he's been threatened with legal action after he published a website alleging a breach of personnel privacy at the government in 2014. 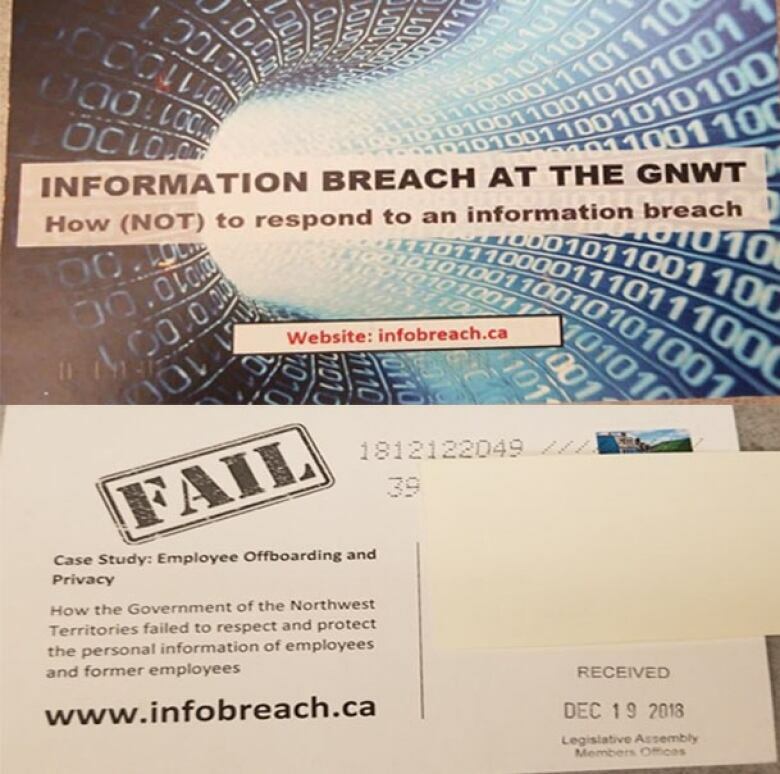 A former manager with the Northwest Territories government says he's been threatened with legal action after he published a website alleging a breach of government privacy along with personal information about his former colleagues. The website details allegations of problems with the government's PeopleSoft human-resources software. Donn MacDougall, a former manager with the justice department's securities division, says information about territorial government employees, including wage information, was emailed to his personal account after he was no longer employed with the government. He posted this information to his website, infobreach.ca. A Law Society of the Northwest Territories document from 2009, which is available online, lists MacDougall as manager, securities and corporate, legal registries, GNWT Justice. 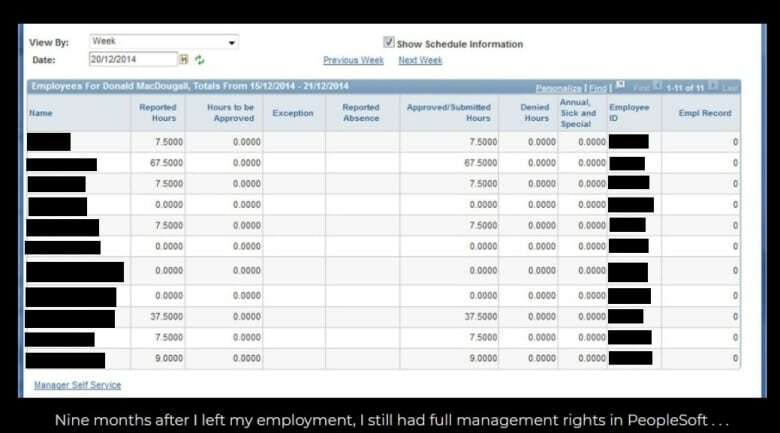 He says he retained managerial access to his PeopleSoft account nine months after his employment ended in 2014, which gave him access to employee timesheets and leave balances, including sick leave. Screenshots of these details were also uploaded to his website. As well, he says his work email address continued to be active and monitored for almost a year after he was no longer employed with the government. He said he decided to make the website after learning more about privacy law around a year ago. "It started to occur to me that what was done to me was offensive," he said. "It really began to sink in to me that if this is something that's routinely done to departing employees, it's unbelievably offensive." MacDougall said his allegations are outlined in a July 3, 2018 report from the N.W.T. 's information and privacy commissioner. That report, which is public, says a complainant could still see "sensitive" information about his former employees through PeopleSoft — a human resources system used by the territorial government — long after he was no longer working for the government. CBC has not independently confirmed MacDougall is the complainant who made the allegations outlined in the report. According to the report, the complainant had access to workers' vacation time, sick leave and overtime. It also says he was getting emails to his personal account containing other employees' contract and wage information. "This is a breach of the privacy of those employees and should not be allowed or even possible," wrote Elaine Keenan Bengts, the privacy commissioner. 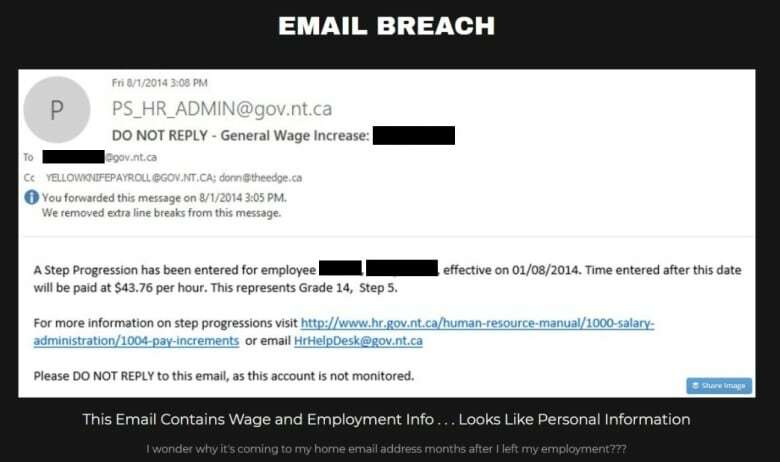 Keenan Bengts also wrote the complainant's government email stayed active after he left his job, and that it was being monitored by another employee, amounting to another potential breach of privacy. The commissioner made a number of recommendations, including that the government do a thorough review of its policies related to email accounts, and that personnel be assigned to processing outgoing employees. Keenan Bengts could not be reached for comment for this story. Sue Glowach, a spokesperson for the justice department, could not confirm before deadline whether the commissioner's recommendations have been implemented. In late December, MacDougall posted an image of what appears to be a cease and desist request from the territorial government on his website. It says if MacDougall does not shut down his website, the government will "pursue any and all legal remedies available to it." "That's a little heavy handed," he said of the message. "When they take the step to say, 'Shut this website down that is critical of the Northwest Territories,' it looks a lot like censorship." MacDougall emailed the CBC a copy of the notice, which is dated Dec. 20, 2018 and signed by Adam S. Vivian, a lawyer in the territory's justice department. MacDougall said he took down his allegations on Dec. 21. The website has been live since the summer, but saw an upsurge in traffic last month after MacDougall sent postcards to N.W.T. politicians and the Union of Northern Workers, which represents government employees, directing them to the site. Glowach said in an email the government became aware of a website "disseminating unauthorized personal information about a small number" of employees in late December. "The information contained on the site was personal information of [territorial government] employees and did not have consent to be released under the Access to Information and Protection of Privacy Act." She said that's why a government lawyer demanded the information be taken down. "The information is no longer publicly visible," she said. A version of the site containing all of the personal employee information originally posted is still publicly visible in Google's cache. MacDougall said he resigned from the Department of Justice in March 2014, after a tenure of eight years. He said he left because the federal government was making changes to securities regulation that would have drastically changed the nature of his job. At the time of his resignation, MacDougall believed he would eventually be laid off. The justice department said MacDougall's former position still exists. Glowach said affected employees who the government has been able to contact have been alerted about the website, as has the privacy commissioner.